Allow me to set the scene for you guys—I’m sitting at MOLO Bar down by Woolloomooloo’s Cowper Wharf, I’m eating caviar, and sipping champagne like an extra in a Ja Rule music video. Not bad for an arts graduate, huh? At this waterfront-culinary strip the well-heeled locals come to wine, dine and debate whether to buy a Porsche or a Mercedes (probs). So naturally, I’m feeling out of place in my ‘dressy jeans’ and big-girl blazer. Luckily, the team at MOLO are both ever-so-charming, and accommodating, as they top up water glasses and light the outdoor heaters. MOLO Bar has popped up at seafood restaurant Manta, with a focus on incredible Italian food that KISS (Keeps It Simple, Stupid—mind out of the gutter people). Dishes feature four (five ingredients tops), sourced from hard-to-get producers who are big on quality and delicious-ness. Being a pop-up means it won’t be around forever, so you better be quick and snag the burrata con caviale, MOLO’s signature dish. A ghostly orb of yielding, oozy burrata laden with an illicit amount of mineral-ly black caviar and a lick of extra virgin olive oil. 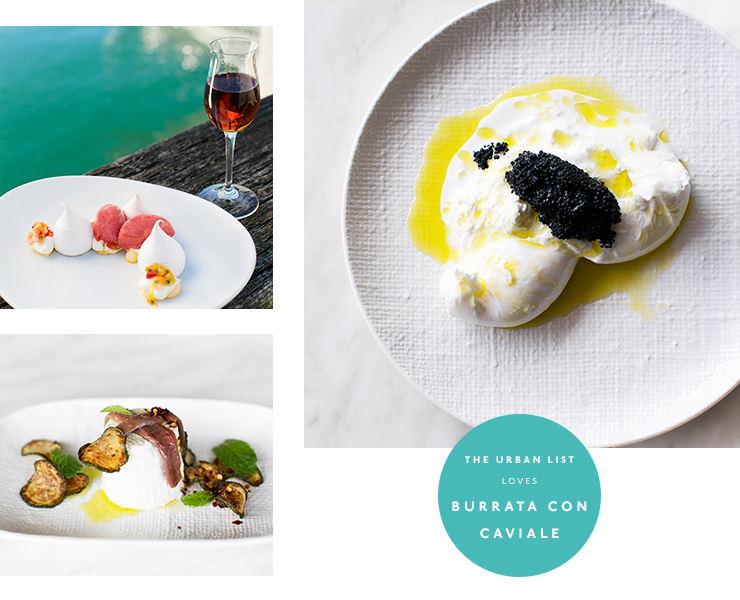 The caviar is Swedish; the burrata, made from buffalo milk imported from Campania, Italy. This is the headiest dish you’ll find in these parts, and it’s almost criminal to serve up such generous luxury for just $32. When the ricotta with zucchini and anchovies arrives, the wait staff, worried about my over-ordering, warn me not to eat too much of it. Made with that Campania buffalo milk, it’s way denser than the fluffy ricotta I’m accustomed to. But it’s too good to resist—it’s rich, almost meaty, and too easily plonked onto the accompanying light-as-air Sardinian parchment wafers. So of course we eat it all. What else? The veal scaloppini is insanely good, the meat cooked just right and balanced with a pleasantly sweet marsala reduction. The prosciutto is cured the old-school way by local charcuterie Master De Palmer, i.e. with the pork leg still in. A white asparagus salad, the shaved spears albino against the plate, is super fresh, scrumptious...and simple. I could just sniff the tagliatelle ai funghi di pino forever. Made with the last pine mushrooms of the season, fresh stracciatella cheese and handmade pasta, it’s at once comforting, earthy and sensual like a Barossa Valley ad. Cue the Nick Cave soundtrack. a leafy vegetable related to the broccoli, is traditionally served with orechiette but here it’s sauteed with nutty kipfler potatoes, chilli, garlic and lemon. It’s dark, bitter and mysterious—like a Tinder date with a sullenly handsome man. There’s great balance throughout the menu, formulated by owner Riccardo Bernabei and executive chef Daniel Hughes. Ain’t nothing too heavy, too complicated, too facsimile. Bernabei has a mild obsession with the food of south Italy, and his menu reflects his childhood and the food he wants to eat. At one point he rushes out of the kitchen to show me some newly arrived purple speckled radicchio from a supplier. And sommelier Mario Mondo is a gem. His enthusiasm and knowledge of wine is impassioned and impressive. 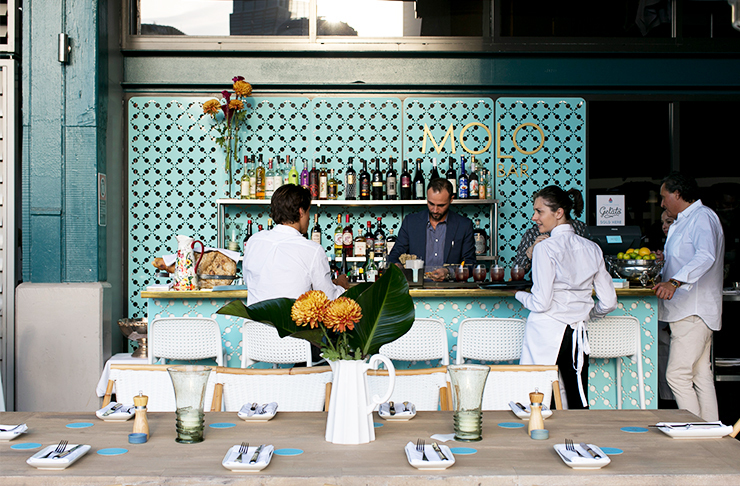 MOLO Bar is slated as a pop-up, but I sure hope it sticks around Sydney for much longer. This is luxe Italian fare for non-luxe prices, made with passion and care. Get here quick—whether by Porsche or public transport. Anyone else feel like a wine? Check out 48 Hours In The Barossa Valley.